← Yoga and Protein Ice Cream. For some reason, I’ve been getting up at an ungodly hour. Today, I snapped myself awake at 5:30, only to realize my alarm wasn’t due to go off for another hour. I managed to get back to sleep, and when the alarm went off I stumbled to my closet, pulled on my workout gear, and managed to do 40 minutes on the elliptical. After a quick shower, I was craving a smoothie, and a PB and banana one sounded perfect. So I mixed up 1 frozen banana cut into chunks, 1 c Almond Breeze Original, and 1/2 tbsp Peanut Butter Co. White Chocolate Wonderful into my blender (with a little bit of water to thin it out). 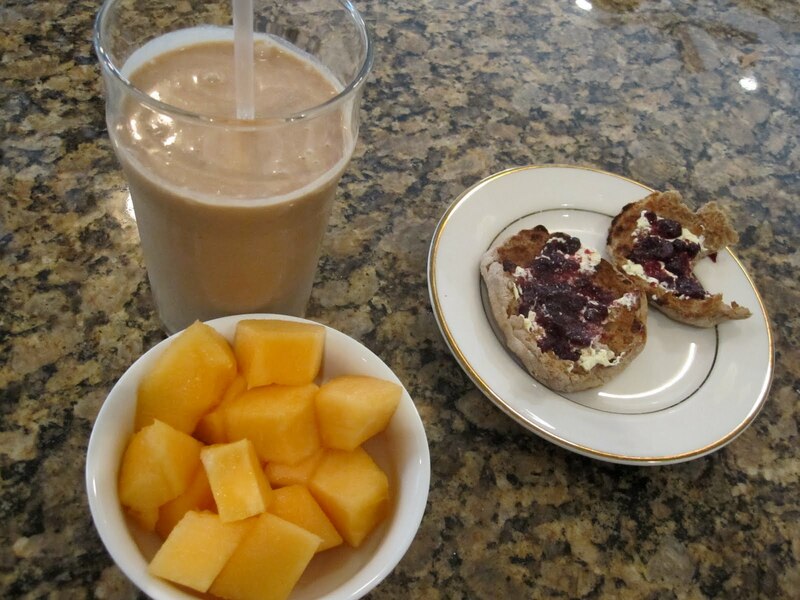 Paired with Thomas Whole Wheat English Muffin spread with Smart Balance and Stonewall Kitchen Sugar-Free Cherry Jam, with 1 cup of canteloupe on the side. The smoothie was like a peanut butter milkshake. It hit the spot on a hot, sweaty morning! And I love English muffins, and this one was toasted just the way I like it: Almost black with a deep crunch. I love burning my toast, is that weird? 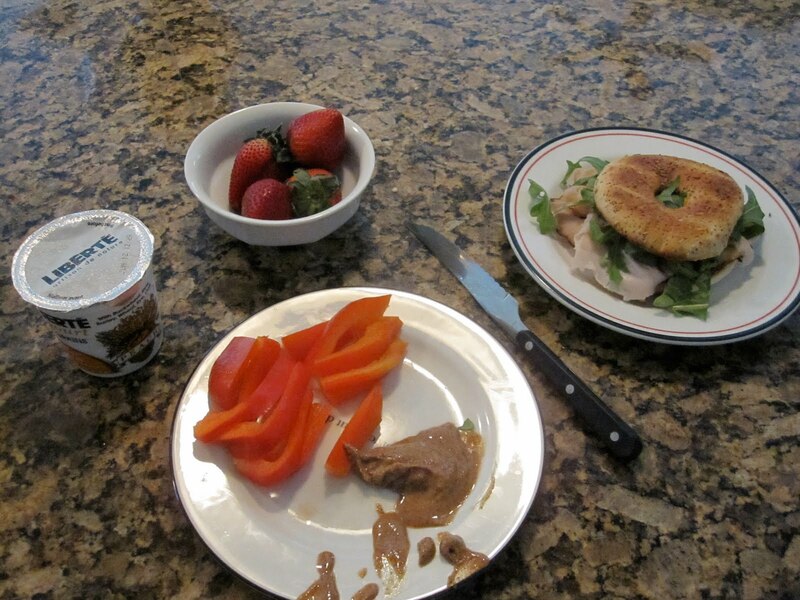 After running around all morning (with time for a nap, thank goodness), I broke into my jar of Woodstock Farms Almond Butter with 1/2 red pepper and enjoyed it with a Turkey Sandwich on Thomas Everything Bagel Thin with arugula and mustard. I also tried a new yogurt (well, new to me): Liberté Six Grains Yogurt in Peach. This is from a Montreal-based yogurt and dairy company that I’d seen around in the supermarket. Their other line, a Greek-influenced yogurt called Mediterreanee, is ridiculously thick (and made with whole yogurt, so ridiculously high in calories, too! ), but I was drawn to this one because of the idea of the six grains. The company claims it’s decided to ‘simplify your life’ by adding breakfast grains to the yogurt so you don’t need to add any granola to it. The six grains in question are rice, oat, buckwheat, barley, rye, and wheat. I must say, it was weird to bite into an otherwise creamy yogurt and end up having to chew through a barley pearl. But the yogurt tasted good, and it’s sweetened simply with fruit juice and agave nectar, which I found really interesting. I’ll have to give their other flavors a try!